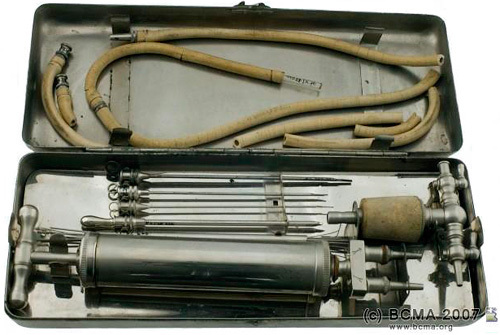 BCMA's Medical Museum Collection Is Now Online | OhGizmo! Hallowe’en’s just around the corner and quite frankly there’s nothing more horrifying to me than old-timey medical instruments. So instead of watching any of those lame ‘horror’ movies on TV (except for Shaun Of The Dead) I suggest spending a couple of hours poking through the British Columbia Medical Association’s Medical Museum which is now online for your gawking pleasure. The site is broken down into various sections, and while I still haven’t had the courage to look at the Dentistry page, some of the others aren’t so bad. For instance, the device pictured above is an aspirating set that dates back to the year 1900 and was used by Dr. R. Eden Walker G.P. in his New Westminster practice. Now I’m sure in another 100 years Andrew MK-IV will be hyper-blogging the same thing about the medical instruments we use today, but that doesn’t make the antique tools in this collection any less unsettling.